Almost there! I’m really aiming to get it finished tonight as it’s the mummy to be’s birthday today and it’d be lovely to say that I finished her baby’s blanket on her birthday. It’s feasible, if I don’t get distracted! What are you working on this week? Are any of your projects almost finished? I need to decide what to make next! Previous Post Ready, Steady, Grow! Still working on my crazy stripes. I just want it to be finished now. I’m getting a hankering to work on something new. The blanket is looking gorgeous! Thank you, how much further do you have to go on your stripes? It’s kinda hard to tell as it’s worked asymmetrically. Ive finished one front and nearly finished the back but have quite a lot more of the other front to go, as well as sleeves and button bands etc. Gorgeous, gorgeous, gorgeous! Hope you do finish it today as that is a lovely thought, and makes it even more special. WIP? Dog blanket. I know my place!! Thank you, I finished the main part but not the border, it still counts as being done today though I think! How are you making the dog blanket? Just knitting. Haven’t braved any attempts at crochet yet! It looks great! You’ll have to tell me if the holes are okay for baby fingers, I have a few pregnant friends in need of baby blankets! Thank you, the holes are fairly big, but I think my friend is going to use it in her baby bouncer/rocker in the living room so I’m not too worried about them. I used a 3.5mm hook too, so although it took ages it made smaller holes. This pattern also has quite large holes between the chains and shells that would be there no matter what hook size you use. Hope you get to make one, it’s a lovely pattern. I love this. I want to make one. Don’t tell my three unfinished afghans about this, though. 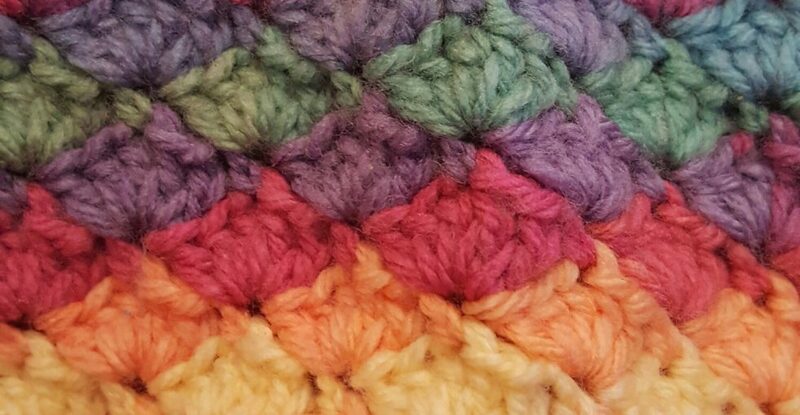 I particularly love this stitch pattern. It’s very stylish and elegant and I just want to stitch the shells. I will be making an afghan like this soon enough, I think. I just should finish at least one of my current afghan projects before getting into another one. 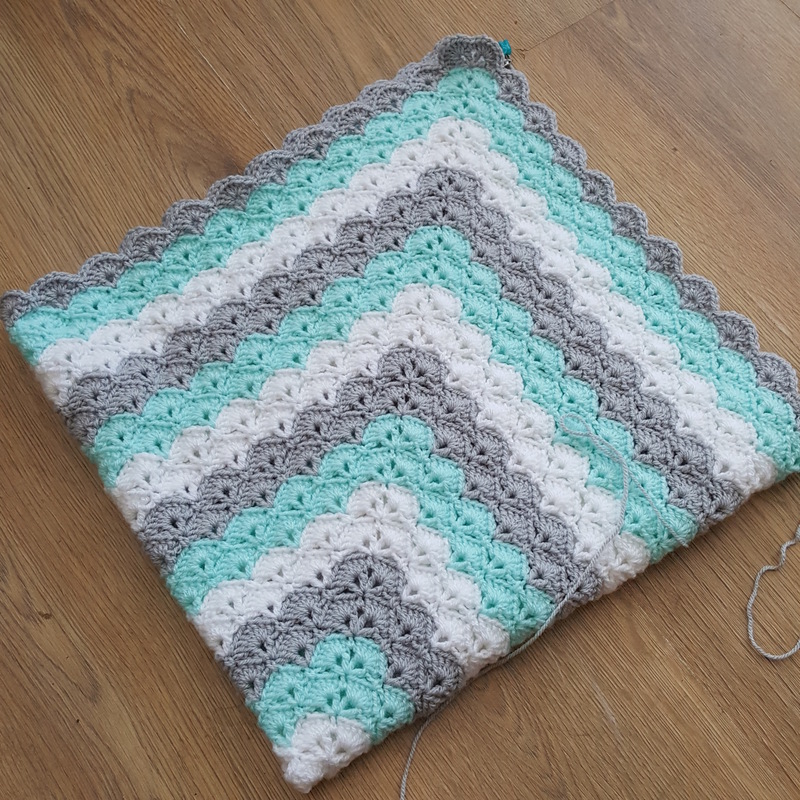 It’s a super pattern for a baby blanket, hope you get a project finished soon so you can start one! I am almost done with my quilt that i started last year i am hand quilting it, it is so relaxing to me. That sounds lovely, I enjoy sewing by hand, it’s really satisfying. 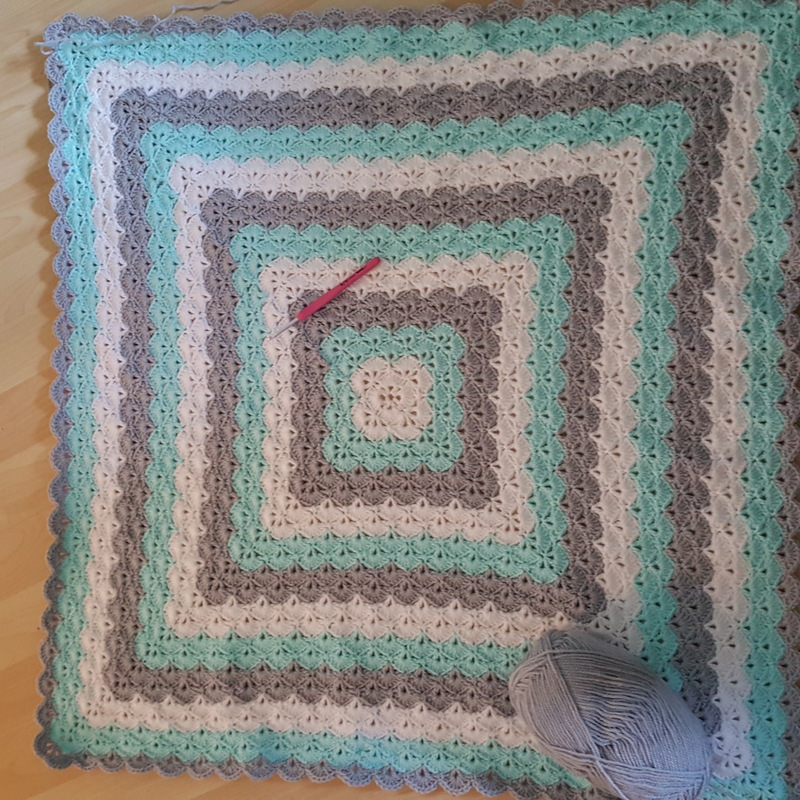 Still beautiful 🙂 I’ve nearly finished my baby star blanket, but I’ve got another idea brewing in the back of my mind so my hands won’t be idle for long! That sounds lovely, they are such gentle colours. That would be a lovely day to finish. Did you manage? I managed to finish the main part, and last night completed the border and sewed in the ends. Now I just need to take some nice photos of it. So pretty! I love the stitch and the colours! I too am working on a baby blanket or two! Just have the borders to go then i will send them next week! Thank you, baby blankets are so lovely to make aren’t they?